At the beginning of 1999, my friend Richard (Mr.C) and myself (Mr.D) went on a bike ride through the streets of Bangkok. Four months later we arrived a tad dusty and slightly unshaven into Kathmandu, Nepal after a journey of over 5000kms. 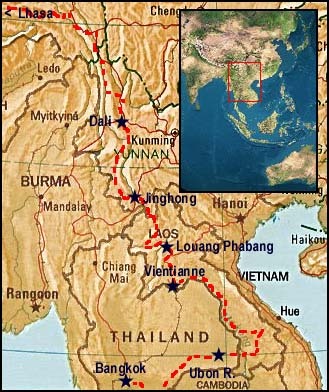 We followed the course of the Mekong river, from exotic beaches near Cambodia, past unexploded ordinance lying on the Chi Minh trail, through Laos where we drank copious amounts of rice wine with Hmong villagers; bounced around bike-eating potholes on Chinese roads, climbed huge snowy passes in the Himalaya, and finally were arrested by the Chinese Gestapo in Tibet. This is our story written up in cybercafes along the way. Where Mr.C & Mr.D start cycling and find paradise lost. where Mr.C becomes a DJ, and Mr. D falls out of a bus! in which Mr.C & Mr.D are catapulted into a wonderland of economic liberalization and another bout of the explosive doo doos. in which Mr.C & Mr.D conquer Chinese roads - just. in which Mr.C & Mr.D get arrested on the roof of the world. in which Mr.D has troubled thoughts on the development of the world.